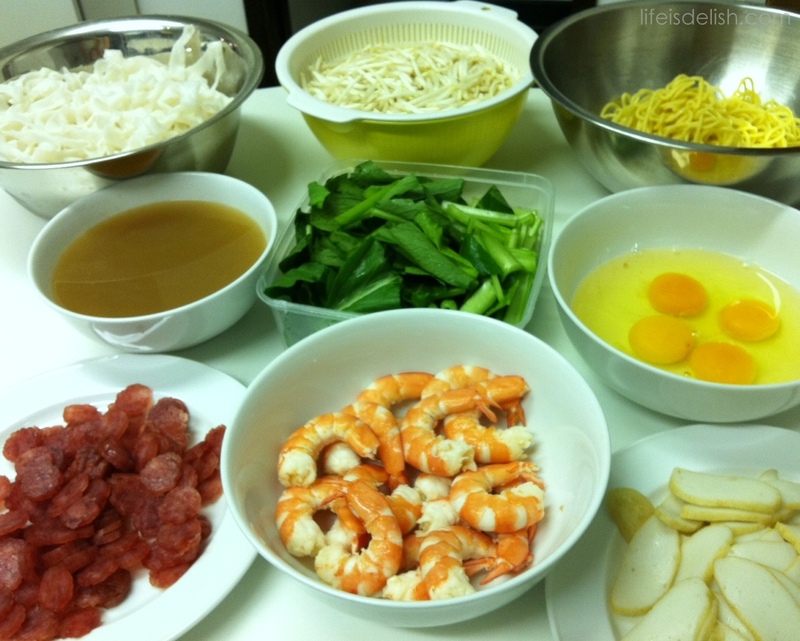 So here I am with the recipe for Nonya Laksa. This is an extremely tasty and addictive dish, and although it may sound daunting to make since a number of steps are involved, you will find the result well worth it. 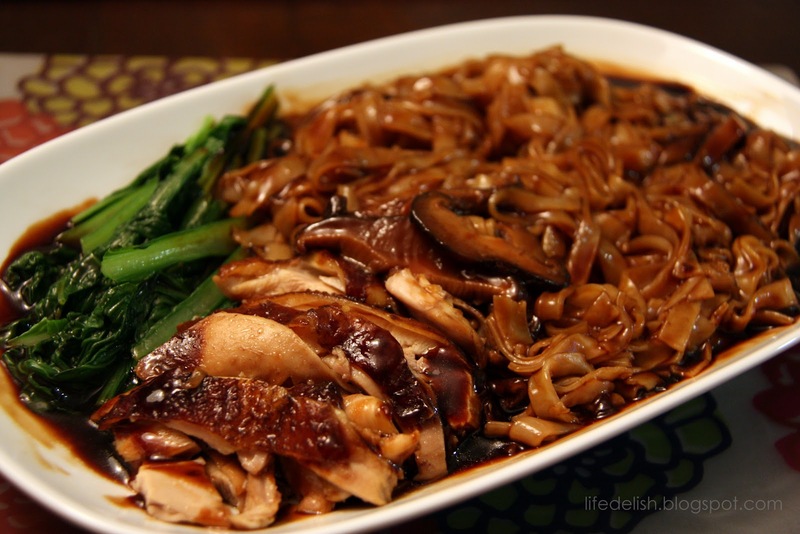 It is one of those dishes you shouldn’t rush, and it will definitely taste better with some TLC. I cooked it in fairly large quantities, so the recipe here is based on a reduced portion. It would make 5 servings. I really hope you will enjoy making and eating this as much as I did! Grind rempah ingredients in a food processor into a fine paste. Add about 2 tsp of finely chopped laksa leaves (from about 2 stalks) into food processor and whizz for a few seconds together with the paste. 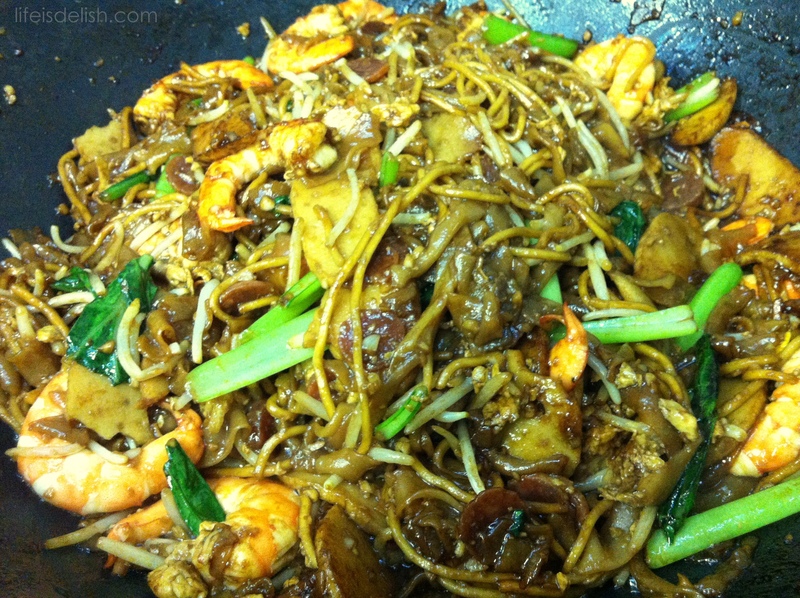 In a wok, heat up 2-3 tbs of cooking oil, and fry paste until its colour darkens. If it gets too dry before this happens, add a little oil. Set aside rempah once it is done. In a large stock pot, bring 1.8L of water to a boil and add the prawns, with shells on, then simmer till the prawns are cooked, remove quickly and refresh with cool water. Once cooled, shell prawns and return shells and heads into stock pot. Set aside the prawns. Bring pot to a boil, then lower heat and simmer about 1.5 hours. Add a handful of laksa leaves to the stock pot (from approximately 3 stalks), and allow to simmer for another half hour. Hard boil the eggs, then shell them, and if using chicken eggs, slice them (quail’s eggs may be served whole). Blanche the tau pok in a pot of boiling to remove some oil, then drain and slice them. Rinse cockles thoroughly in a basin of cool water, changing the water until the water turns clear. Drain. Place cockles in a basin or small pot and pour boiling water over them and leave for a minute before draining them. Refresh with cool water to prevent the cockle flesh from continuing to cook and becoming too tough. Remove the flesh and set aside. Discard shells. Blanche beansprouts quickly and drain. Finely chop the remaining laksa leaves (you should have about 5 tsp)*. Cook rice noodles in a pot of boiling water, refresh and drain. Strain stock after it has been allowed to simmer for 2 hours, and return to stock pot. Add rempah to the stock and bring to a boil, then lower heat and simmer till oil surfaces. Skim. Lower heat. Add coconut milk (a little at a time), bring to a boil, the lower heat to simmer for a few minutes. Add rock sugar and salt to taste. If necessary, add more coconut milk. Place a portion of the cooked rice noodle into a bowl. 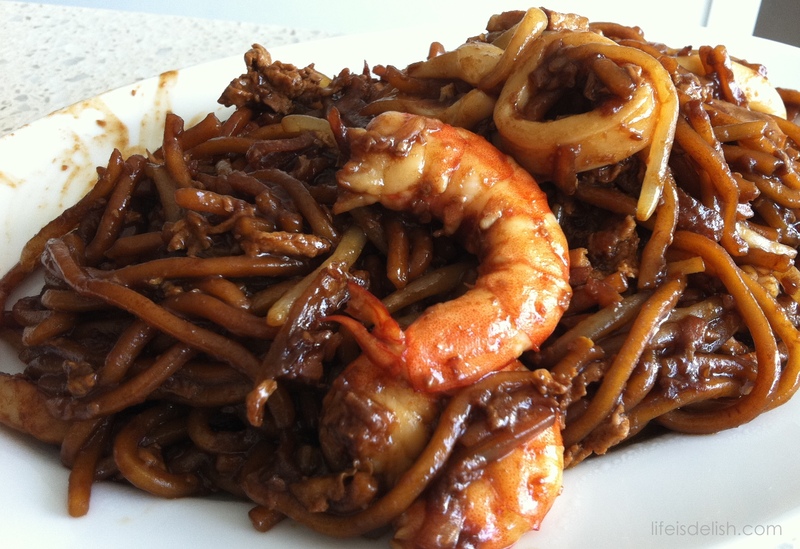 Arrange prawns, tau pok, beansprouts, cockles and eggs over the noodles and then pour some gravy over it. 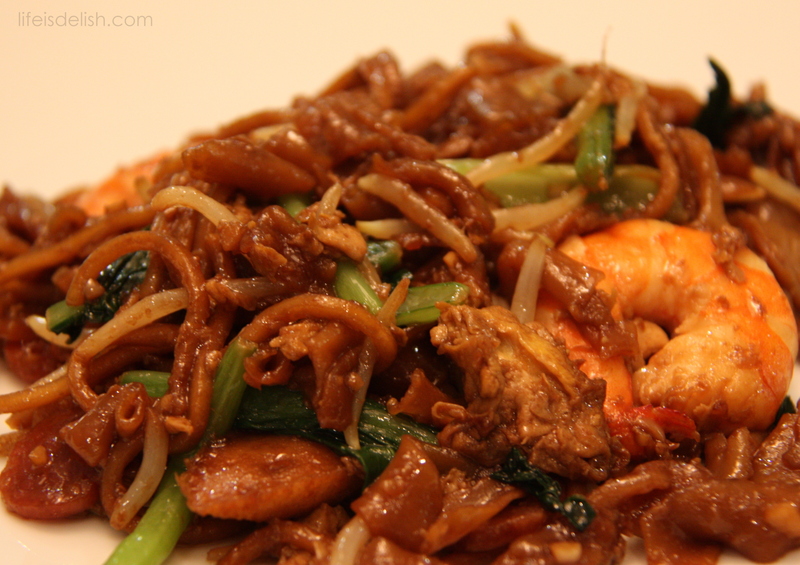 Sprinkle with 1 tsp of chopped laksa leaves and serve with sambal if available. 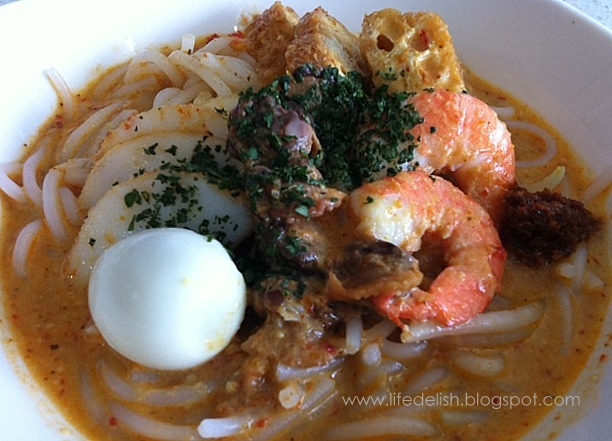 * If you are not able to get the amount of laksa leaves required in this recipe, try to ensure that you have at least 4-5 tsp of chopped laksa leaves for sprinkling over the individual bowls, and omit the laksa leaves in the rempah and stock if you have to.